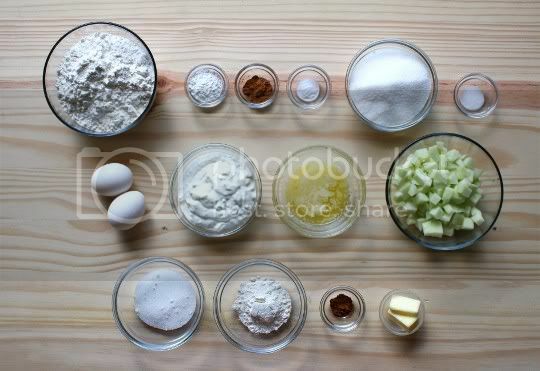 I was all ready for these to be just some regular ol' apple muffins, like so many varieties I've made before. But to my surprise, these were even better! In fact, the tart apple, the tenderness of the muffin, and the delicious streusel topping made these taste just like apple turnovers. Yum! These easy-to-make muffins use your standard pantry and fridge ingredients, so you can probably whip these up at any time. The batter includes both sour cream AND butter, so you know these have a rich flavor and moist, fluffy texture. 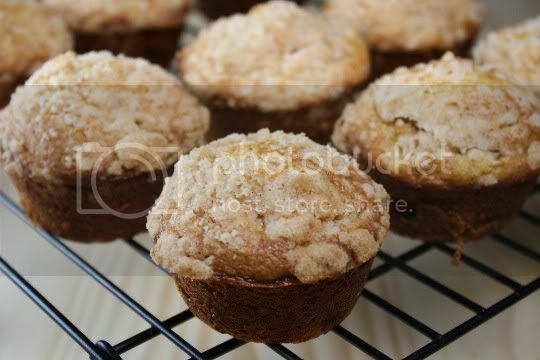 The streusel topping is a simple mixture of sugar, flour, butter, and cinnamon. This is liberally sprinkled atop the muffins before baking, and it really takes them to new level of decadence. 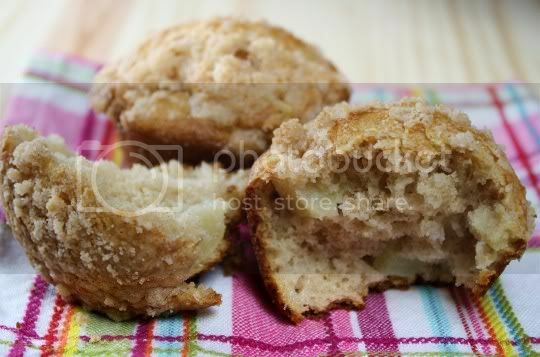 I found the muffins needed about 3-5 minutes of additional baking time, but they still remained soft and fluffy, with a crunchy outer crust and perfectly tender apples. The muffins themselves are very sweet, so the tart apple is a welcome contrast. You probably can use a sweeter apple variety, but I'd suggest decreasing the sugar amount by maybe 1/4 cup or so. The crunchy streusel topping also adds sweetness, but it's a sweetness that's mouthwatering, fragrant, and addictive. Make again? Yes...and these are absolutely amazing fresh out of the oven (but they do freeze well)! Vegan variation: Use egg replacer, and vegan versions for sour cream and butter.